PLEASE NOTE DUE TO IMPACTS OF THE FLOODING THIS EVENT IS CANCELLED AND WILL BE RESCHEDULED AT A LATER DATE! 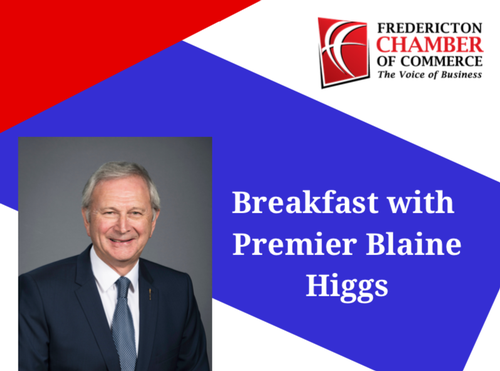 Come join the Fredericton Chamber of Commerce and Premier Blaine Higgs for Breakfast! First elected to the Legislative Assembly on September 27, 2010, Blaine Higgs served as Minister of Finance from 2010 to 2014. He was re-elected in 2014 and again in 2018 representing the riding of Quispamsis. On October 22, 2016, he was elected leader of the Progressive Conservative Party of New Brunswick. Mr. Higgs was sworn in as Premier of New Brunswick on November 9, 2018. Born in Woodstock, he graduated from the University of New Brunswick with a Bachelor of Science degree in mechanical engineering. Following university, he joined Irving Oil Ltd., where he held numerous positions of increasing responsibility in engineering, refining operations, and in the transportation sector. Prior to retirement in May 2010, he was Director of Logistics and Distribution, with overall responsibility for the transportation and bulk storage requirements for the reliable supply of refined products to customers throughout Eastern Canada and New England. He also served on the Board of Directors for Canaport LNG and the New Brunswick Gateway Council. He has travelled extensively for both business and pleasure. The insight learned through this interaction with different cultures provides him with an appreciation for the challenges that New Brunswick faces in the global economy. A long-time resident of Quispamsis, he is married to Marcia, and the couple has four daughters: Lindsey, Laura (Reid Gilmore), Sarah (Jeff Wilkinson) and Rachel (Matt Hiltz). They are also blessed with four grandchildren: Nadia, Alexander, Samuel, and Sadie.